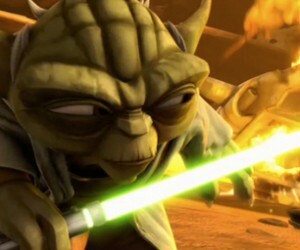 In my last Clone Wars post, I forgot to mention that another thing I love about the show is how it opens every episode first with what seems to be a Jedi proverb, to replace the classic “a long time ago” from the films, and then a short, expository description of the circumstances into which the show is about to drop us, done in the style of a 1940s WWII newsreel, with the enthusiastic narrator extolling the virtues of our Republic troops. This is extremely clever for numerous reasons, firstly in how it finds a fun, dynamic method of replacing the classic news crawl that opens each Star Wars film that feels cool, fresh, and just a tiny bit cheeky. On a deeper level, however, the WWII reference also speaks to the show as being a historical document of a past time in Star Wars history whose outcome we already know, while the propagandistic overtones of the style (which, in WWII were treated completely straightforwardly by citizens but which we can now interpret as being manipulative and controlling) ironically comment on the subtext that these carefully embedded troops and the optimism with which the Republic is treating them, will, in the not-too-distant future, lead to its downfall. This episode is the first (at least in linear, storytelling progression) to not feature any of the series’ main characters, and which doesn’t feature any space travel or cutting between multiple planets. Instead, it is basically a rather intimate short story that is fully set on Kamino–the watery planet on which the clones are made, which we first visited in Episode II–and focuses on the “Domino Squad,” a small squadron of cadets who have, so far, failed to live up to the standards required for the clone troops. Although in some ways, this seems the least epic episode thus far, in another way, it actually speaks to just how epic the scope of the entire series is, in that it encompasses the entire Star Wars universe and has the luxury of delving into elements of it for which the films simply didn’t have time. Here, we have a full 20 minutes to not only examine the Kamino training facilities but to get into the minds of a number of the clones, specifically ones who might not make the grade. The previous clone-centric episode, “The Hidden Enemy” was arguably our first strong indication in the Star Wars universe that the clones aren’t all identical beings with a practical hive mind, and this episode continues that thread beautifully. Who knew in the prequels that there could be clone misfits? Here, we see how the members of this small group, who began at odds with one another, learn how to work together to achieve their goal and even think creatively under pressure in order to accomplish it, each one playing to his own strengths but using them to complement one another. Among the various nuances revealed in the episode are that some clones don’t come out “right,” such as the janitor, “99,” who seems to have grown past the aging with which he was designed into someone old and feeble, but also that in other cases, difference doesn’t have to be a bad thing. In fact, it could be an advantage. The problem before was that each of these more self-actualized clones was reacting to his own individuality by thinking only of himself and not the group, while at the same time continuing to be treated as numerically labeled cogs in a machine by his masters. The Domino Squad members were chafing against the need to conform to the standard. But, ironically, as soon as they begin to embrace their individuality and to claim names for themselves, they are able to relate to one another as individuals and to truly work together. The Jedi master, Shaak Ti, even proclaims that they might be the best clone squad she’s ever seen. The ending, in which the clone, Hevy, bids farewell to 99, who had named him, and confirms that he is one of their brothers, as well, is extremely emotional and uplifting in the moment but is also laced with the dramatic irony–as are all of this show’s happy moments–that the endgame that these clones are unwittingly fighting for is not just. In the end, they will all be the Chancellor’s unwitting puppets. Incidentally, as far as continuity goes, the episode also confirms that, with Jango Fett dead, a new clone prototype will soon be needed, thus confirming whether all of the clones from this point forwards will all be copies of Fett or not. 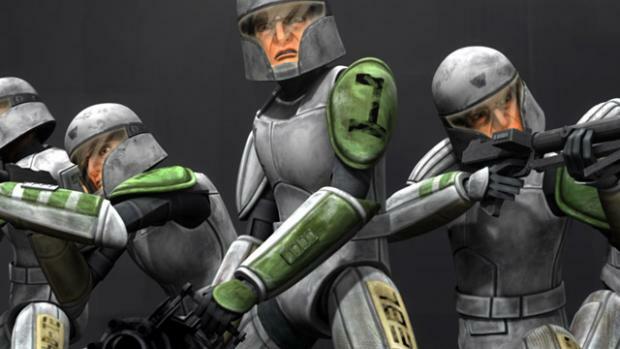 I’ll be curious to see if any of the clones we see on the show are eventually of this new stock.